The Seahawks showed no sign of jet lag in a 27-3 mauling of the Oakland Raiders that gave Seattle fans reason for optimism going into the bye week. Here's a look at what the national (and international) media thought of Seattle's win in London. There’s life to them yet! In front of the largest-ever crowd to watch an NFL game at Wembley Stadium, the Seattle Seahawks trounced the Oakland Raiders 27-3 on Sunday. This was arguably the most well-rounded win Seattle has managed this season. The Seahawks now head into their bye week having won three of their last four games — a significant improvement after their 0-2 start. Here’s what the national — actually, international, because there was plenty of British media at the game! — pundits had to say about Seattle’s win. Calkins | 'Frank the Freak' has arrived. Now it's time to to pay him. ESPN.com’s Brady Henderson concurs with the general assessment that this was a complete game for Seattle. Maybe the Seattle Seahawks just needed a 4,700-mile road trip to finally put together a fast start and a complete performance. Or maybe they just needed to face an old and overmatched Oakland Raiders team. Before Sunday, the Seahawks hadn’t scored a touchdown on their opening drive since Week 3 of the 2016 season. It was the longest active drought of any NFL team, according to ESPN Stats & Information research. So when they started Sunday’s game in Wembley Stadium with an 82-yard, 14-play drive capped by Russell Wilson’s first of three touchdown passes, it ended a streak of early-game futility. And it set the tone for what would be their most dominant performance in recent memory. NFL.com’s Marc Sessler feels bad for the London fans because blowouts don’t exactly make fore high-octane entertainment. But, he notes, this was a good win for Seattle. The Seattle faithful had plenty to smile over, though, as the Seahawks set the tone early at Wembley, unleashing a string of powerful runs and money lobs from Russell Wilson to etch a 14-play, 82-yard scoring drive that ate seven-plus minutes off the clock. That march included signs of life from rookie runner Rashaad Penny, who hauled in a 24-yard catch-and-run and finished with 70 yards off 11 touches. Second-year wideout David Moore also helped out, hauling in a 28-yard catch from Wilson and logging a 19-yard touchdown. … Give credit to a Seahawks defense that continues to play well despite the loss of Earl Thomas. Frank Clark dominated from wire to wire, piling up 2.5 sacks and generating a game-changing fumble that set up a Seattle field goal for the 20-0 lead. Oakland’s tackles doubled as open barn doors all Sunday. The Raiders must find a way to better protect Carr, but part of this boils down to play-calling and an overall scheme that is, frankly, dull to watch. The San Francisco Chronicle’s Matt Kawahara says the first half of Sunday’s game couldn’t have played out worse for the Raiders. They saw Amari Cooper leave the game after a high hit by Seahawks safety Bradley McDougald that wasn’t flagged. They saw Derek Carr get sacked twice and hounded constantly behind a battered offensive line down to its third-string left guard. They failed to score against a Seattle defense coordinated by Ken Norton Jr., whom Oakland fired last November. And then the second half got worse. … The Raiders’ offense totaled 185 yards and averaged 3.3 yards per play. The Seahawks’ gained 369 yards and averaged 6.0. After arriving in London on Friday – a day later than the Seahawks – the Raiders looked like they were still adjusting in the first half. … The Raiders then tried to establish the run on their opening drive and netted one yard on three hand-offs to Marshawn Lynch. Their banged-up offensive line had a brutal first half, allowing constant pressure and generating 25 rushing yards. The San Jose Mercury-News’ Matt Schneidman says that was an utterly humiliating loss for Oakland. The NFL plays games overseas in an attempt to grow the game. If any British fans were on the fence about adopting the sport before Sunday, the Raiders made sure they never want to watch American football again. The Raiders (1-5) were flat-out humiliated against a mediocre Seahawks team (3-3) that’s a shell of the one who made two straight Super Bowls in 2014 and 2015, suffering a 27-3 beatdown in front of 84,992 poor fans that had to watch the Raiders play at Wembley Stadium. The (UK) Independent had this take on the Seahawks’ pummeling of Oakland. The Seattle Seahawks soaked up London’s wind and rain and unleashed an offensive storm on the Oakland Raiders, a franchise that looks increasingly directionless and one which will surely hit the reset button on its roster. Reports on Sunday morning had stated that the Raiders were offering former first-rounders Amari Cooper and Karl Joseph for trades, a sign that after Khalil Mack’s departure they are ready to rip the whole house down before the move to Las Vegas. And on the sodden Wembley turf this team looked like one in desperate need of a rebuild, with Derek Carr incapable of moving the chains despite utilising nine different pass-catchers and the defensive unit unable to stop Russell Wilson. They already looked lost before this resounding defeat but now they look like a team that is about to tank. The Sunday Evening Telegraph’s Ben Coles says this one was over early. London’s 22nd NFL game was finished as a contest early in the third quarter once the Seahawks went ahead 20-0, with the fixtures to come in the next two weeks likely to be far more competitive affairs. 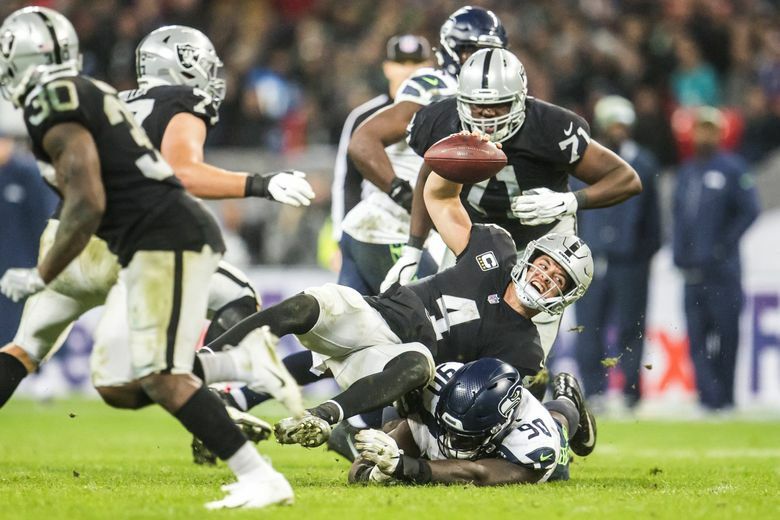 … If no longer the vaunted unit of five or six years ago, there are still some significant talents on that side of the ball for Seattle including defensive end Frank Clark, who showed immediate class with two sacks on Raiders quarterback Derek Carr in the space of three plays. The (UK) Guardian’s Sean Ingle says Seahawks QB Russell Wilson looked right at home at Wembley Stadium. Nearly 4,800 miles and eight time zones separate London from Seattle. Yet for the Seahawks the murk and mizzle of this grey Wembley evening felt like a home away from home as they pummelled the Oakland Raiders 27-3. It rained, a lot, as in the Pacific north-west. And there were large packs of fans in dark blue and lime green jerseys, who shouted “SEA!” then “HAWKS!” with ever greater urgency and booed if the Raiders looked like getting something going, which was not often. To make things even sweeter, Seattle dominated both sides of the ball, with quarterback Russell Wilson throwing three touchdowns and their defence punching holes in the Raiders’ offensive line at will.